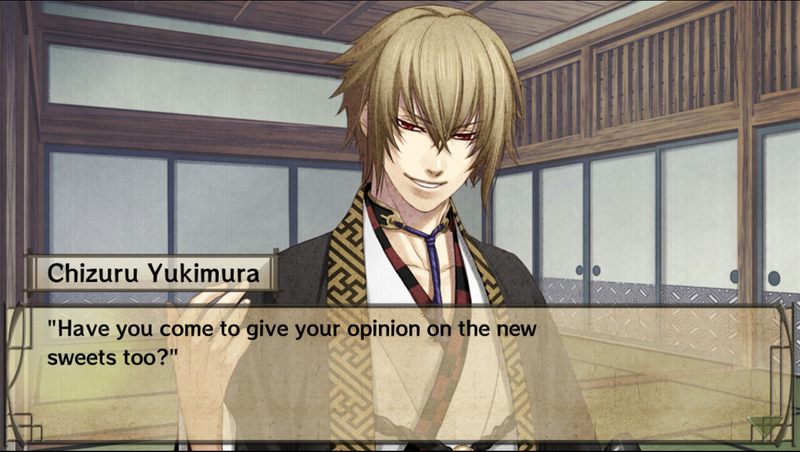 Otomate’s Hakuoki Finally on Mobile Devices! 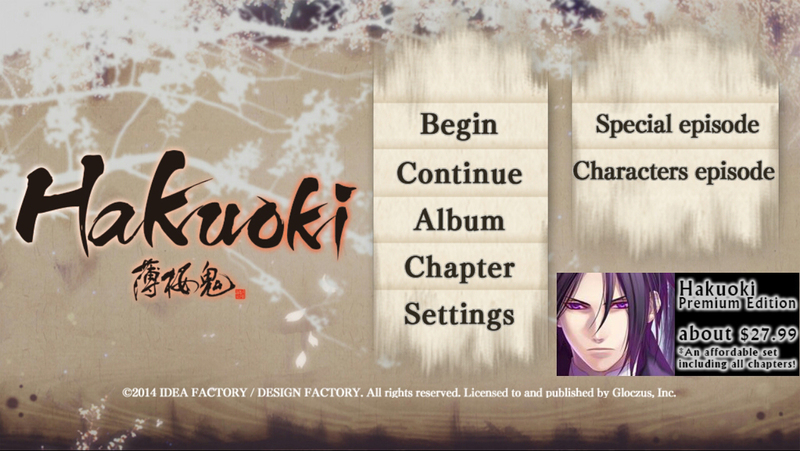 Last week, Gloczus finally released Otomate’s Hakuoki on mobile devices for the US and Canada! Fans all over rejoiced after having waited for a long time for a more portable way to play Hakuoki without having the actual gaming consoles the games were originally released on. 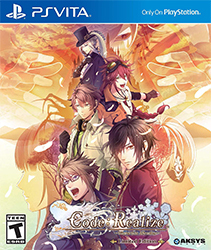 This particular release comes with an exclusive unlockable tea ceremony chapter (already unlocked in the Premium Edition) that fans that have already played the game before may want to play through, since what happens in that chapter is pretty cute! 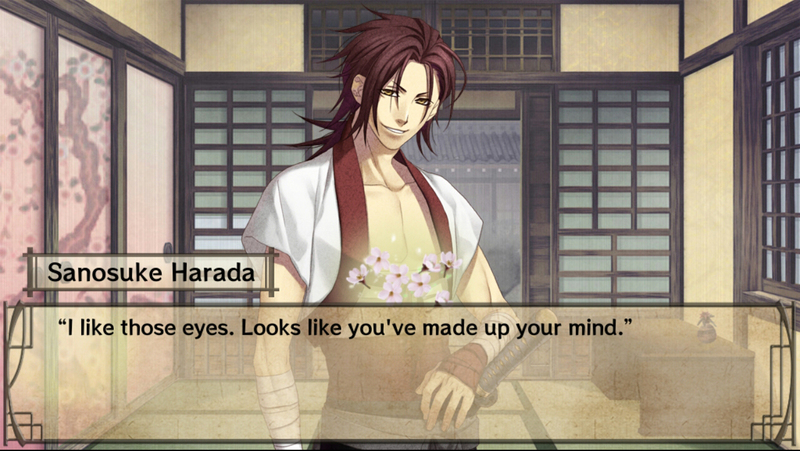 Let’s take a closer look at the mobile release of Hakuoki! 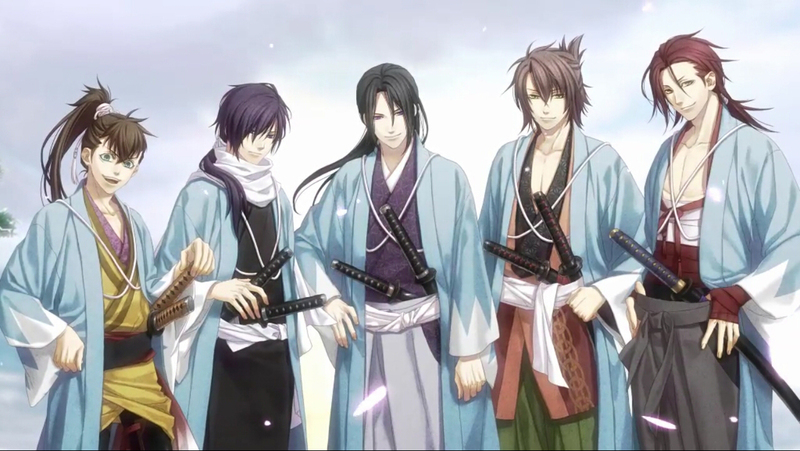 The handsome men of the Shinsengumi! 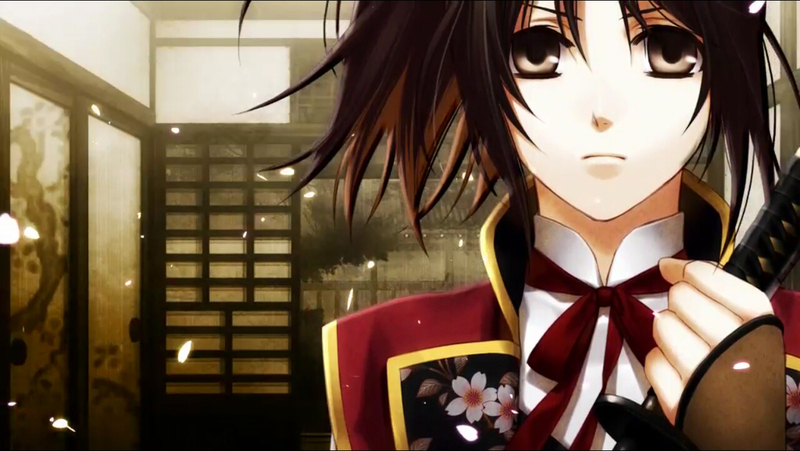 Hakuoki centers around Chizuru Yukimura, a young woman who is searching for her father, Kodo Yukimura, after he went missing for a month without any correspondence. 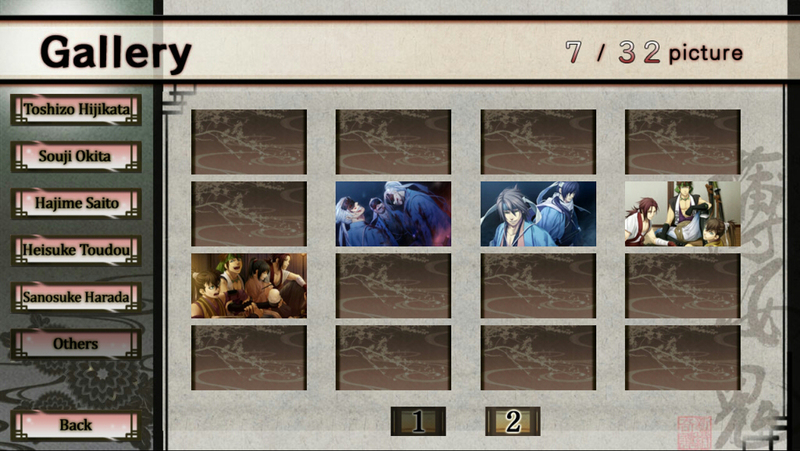 After being attacked by ronin, she is saved by the Shinsengumi and then taken to their headquarters for questioning. Once it’s revealed that they are also looking for Kodo, they place Chizuru in protective custody while they both look for him. Along the way, they face political changes, along with many battles, and even supernatural happenings. 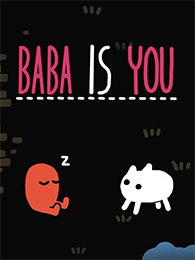 Can Chizuru survive long enough to see her father again and perhaps even fall in love? 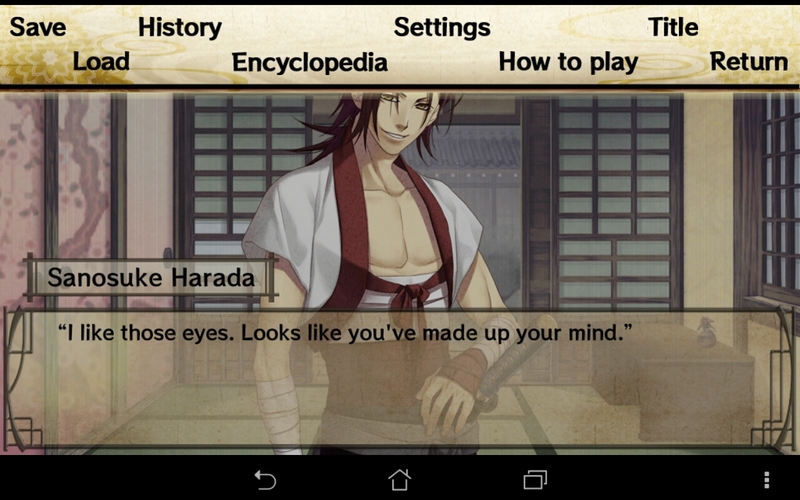 The mobile version of Hakuoki is pretty intuitive to play. 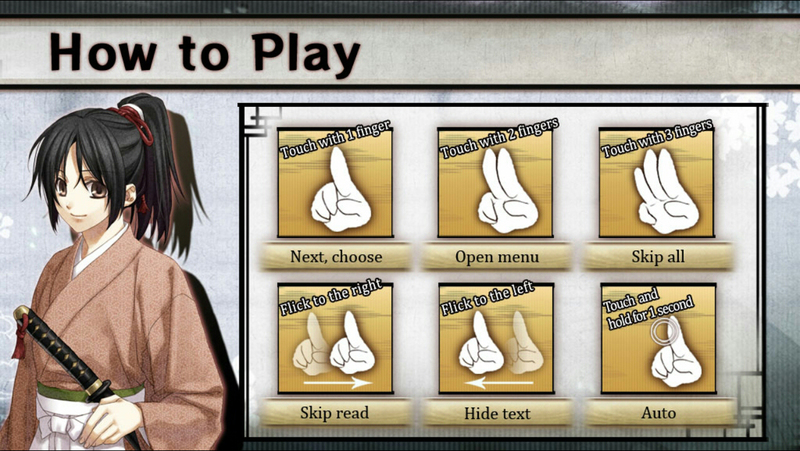 You can tap with one finger to proceed in the dialogue or select a choice, tap with two fingers to open the menu in-game, and touch and hold with 3 fingers to quickly skip through the dialogue until it prompts you with a choice to be selected. You can also slide to the right to skip over read dialogue, slide to the left to hide the dialogue (useful for viewing the CG in-game), and touch and hold for one second to enable auto-play. 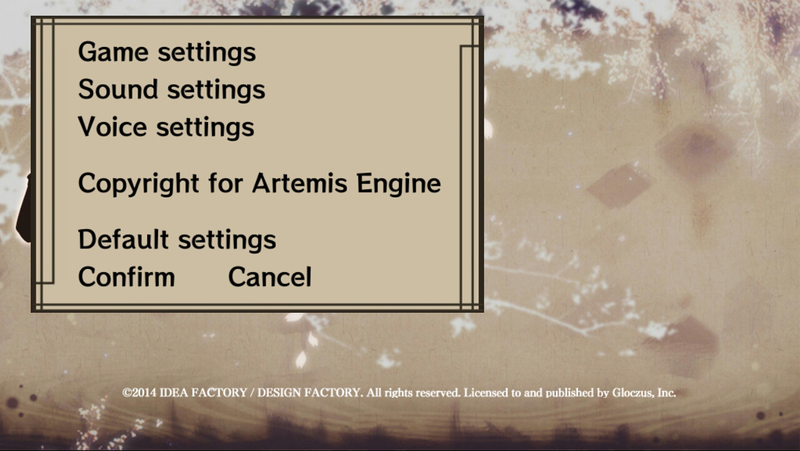 Let’s take a closer look at the title screen and the options you can select within it. 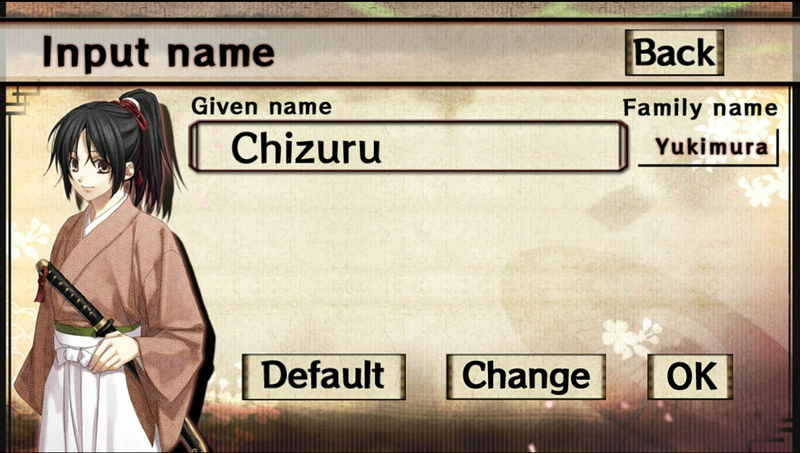 When you select the Begin option, you are prompted to enter a name for our heroine, or choose to leave it as it is. 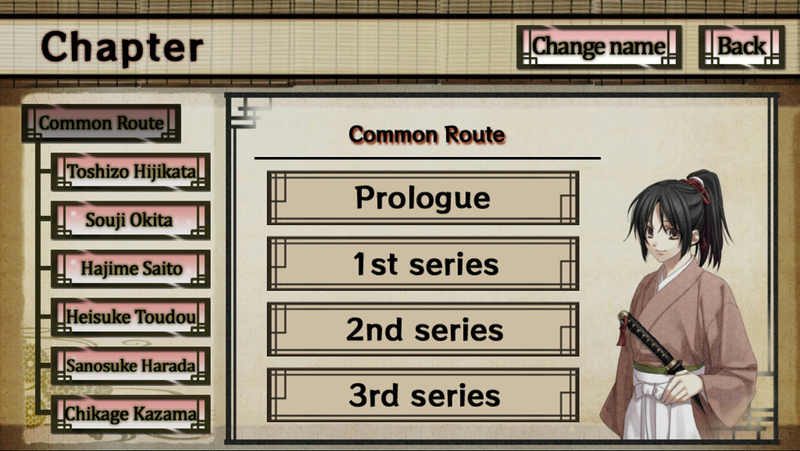 If you’ve cleared a route and choose to begin anew, it’ll ask if you want to choose a new name or keep the same one as before. The Load option allows you to choose your previously saved game to continue. It also has a neat auto-save feature that saves your progress automatically whenever there’s a choice to be made in-game. Within the Album option are the Gallery, Theater, and Encyclopedia sub-menus. 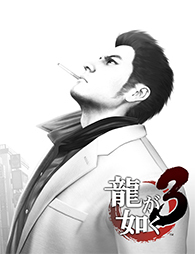 The Gallery has all the CG of the characters and events that have been unlocked as the game is played. The Theater has all the movies that have been played in-game available for viewing. 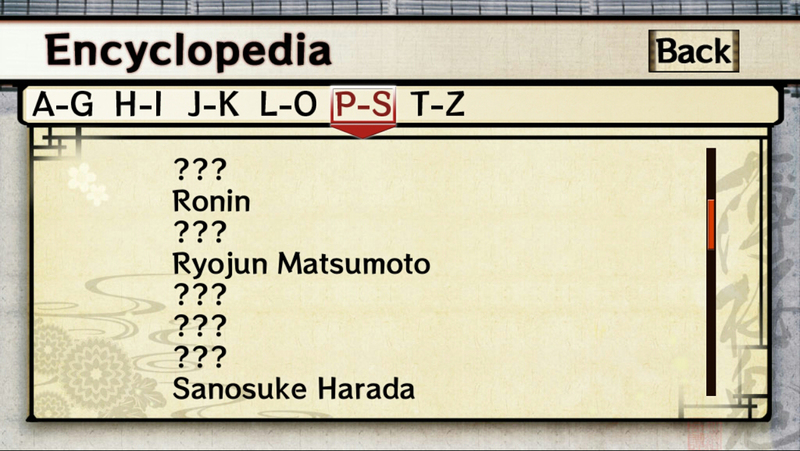 The Encyclopedia is a pretty interesting menu: it has all the terms that are highlighted throughout the game that give more information either about a character or about some historical terms and events that players may not be familiar with. 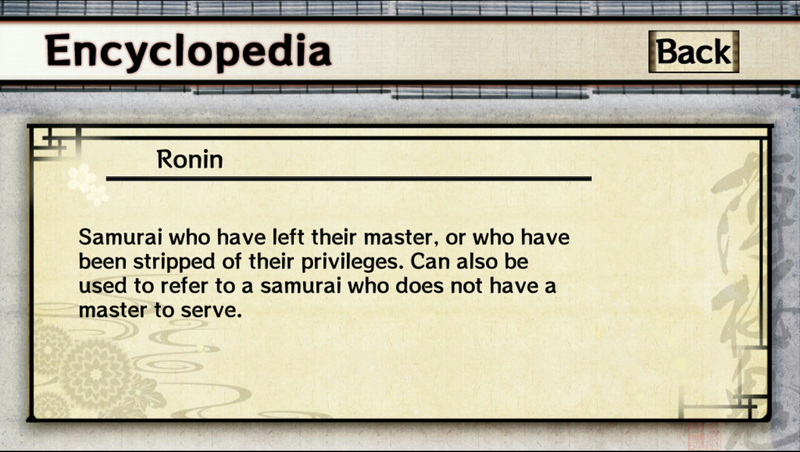 As the game is played, the encyclopedia gets filled with more information. 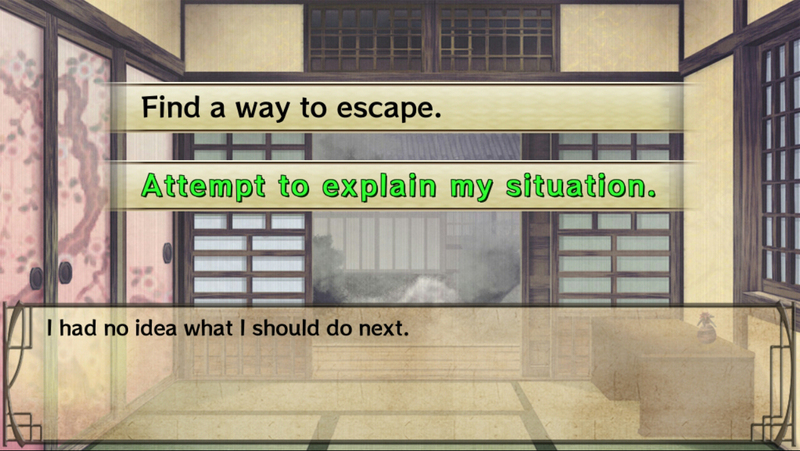 The Chapter option has the chapters that branch out to the select character’s route. In the Premium Edition, everything is already selectable even without having cleared the game yet. If you choose any one chapter, please note that all flags and affections statuses will be reset! The Settings option allows you change various things, such as Skip/Autoplay settings, the text window display, message speed, the volume of the BGM, sound effects and character voices, and even mute select characters. 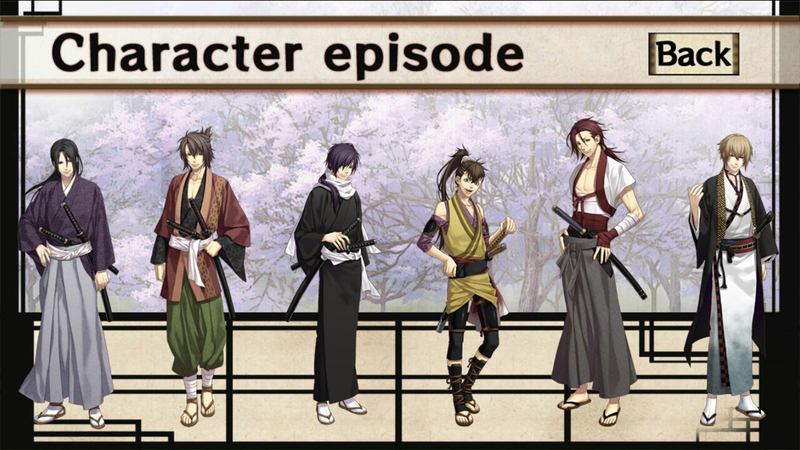 The Character Episode option lets you select a character and plays out a story from their point of view. Note that these stories are different from the main scenario, so you may want to finish the game to know the bulk of the main story before getting to these. It’ll actually pop up that warning if you choose to play the character episodes prior to completing the main scenario. 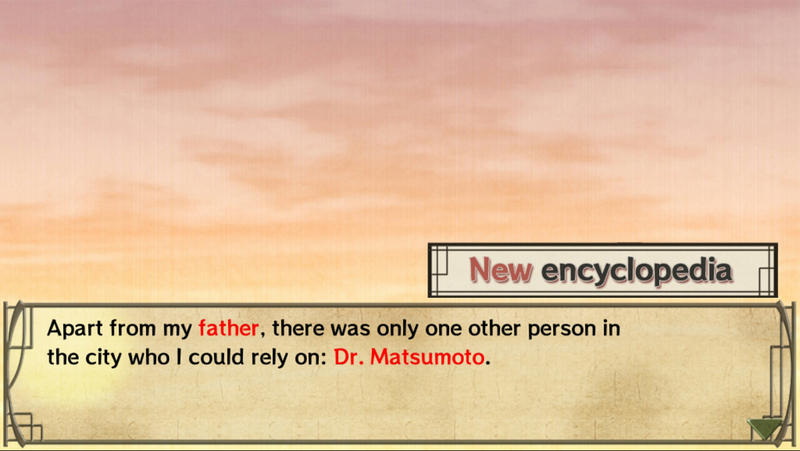 The Special Episode option allows you to play the mobile-exclusive tea ceremony chapter. This chapter is shown to take place in the middle of the main scenario, so you may want to clear that first before you choose to play extra chapter. If you bought the Premium Edition, this is already unlocked for you. If you have the Standard Edition of the game, you will have to unlock this by purchasing every scenario. Let’s talk about how the game plays! All these thoughts while having a sword pointed at her! This game looks great on a tablet! 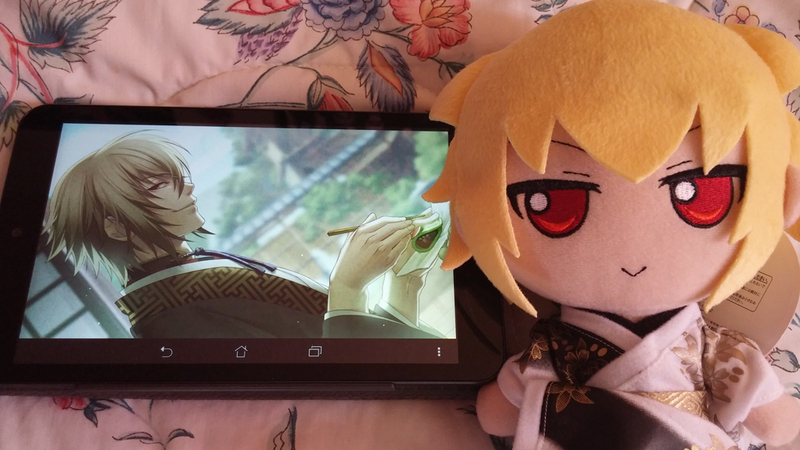 For reference, the device I played Hakuoki on is the ASUS MeMo Pad 8. The transition of the text from scene to scene is smooth.The voice acting is superb and full of emotion; I highly recommend keeping all of the voices on! And of course, the art is gorgeous; the character portraits with their different expressions are really nice to look at, and the CGs just makes me want to replay the game in order to unlock all of them! 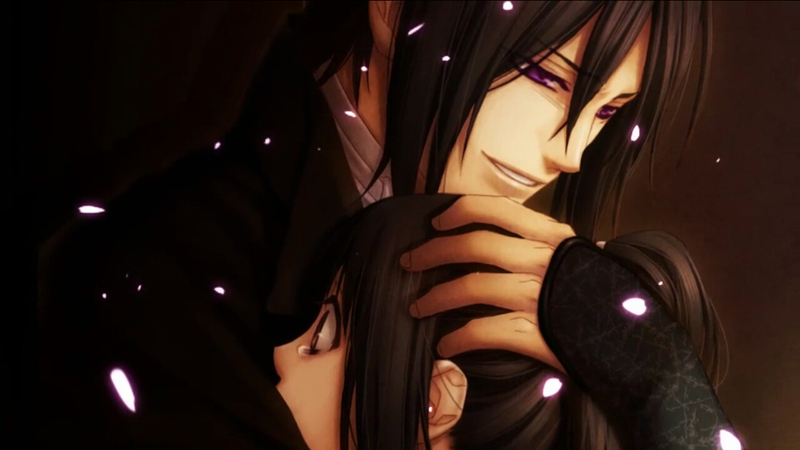 There are plenty of CGs to unlock as you play the game, which encourages a lot of replaying to get all the possible endings. While the controls are pretty intuitive, if you don’t feel like doing the two-finger tap to bring up the in-game menu, you can also use your operating system’s UI to bring up the menu. In my case (I use Android), it’ll be the three little vertical dots on the right, as shown in the above picture. A few things worth noting about the in-game options: if you tapped too fast and want to backtrack to previous dialogue, you can select the History option to see what you missed. Also, in the Encyclopedia option, you can also check the Character Status screen, where you can see how affectionate they are towards you along with their well-being. As you progress in the game, you’ll be faced with choices that will determine which route and ending you’ll be able to get. Choices that haven’t been selected before will have the black text, while the choices that have been selected in a previous playthrough will have the green text. This distinction makes it easy to try out other selections to get another ending. When certain choices are made, it’ll affect the characters depending on the choice. If it affected them on a positive note, little sakura flowers will bloom (called “Love Catch”) on the character! 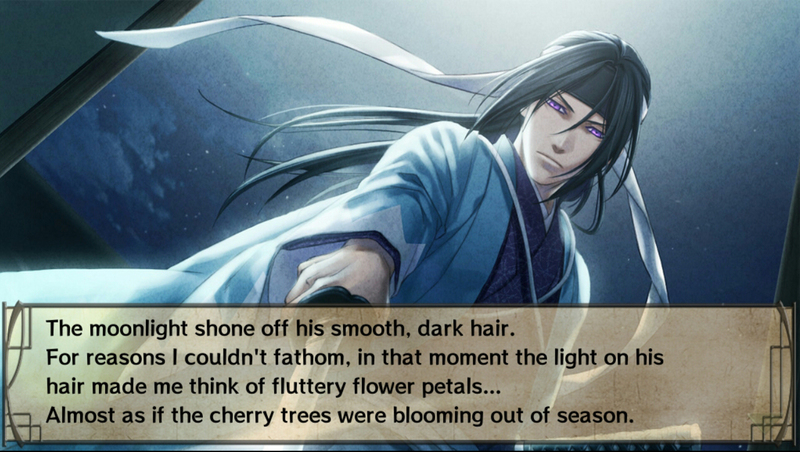 Each time these flowers appear, the character’s affection meter go up, which can alter what route you end up with. New encyclopedia entries will be marked in red text. You can tap to read the entries before moving on with the game. You can view encyclopedia entries at any time by going into the options menu. 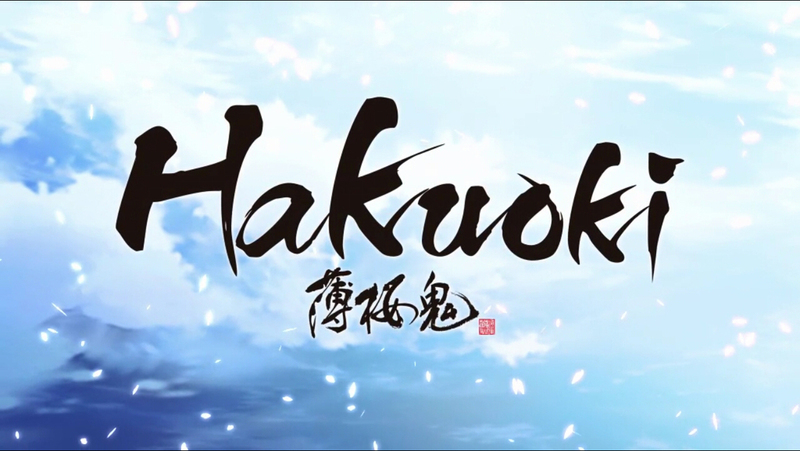 This release of Hakuoki is excellent and a must if you haven’t played any of the other versions before. I highly recommend getting the Premium Edition of the game to get the full experience, not to mention that it actually costs cheaper than purchasing each scenario separately. 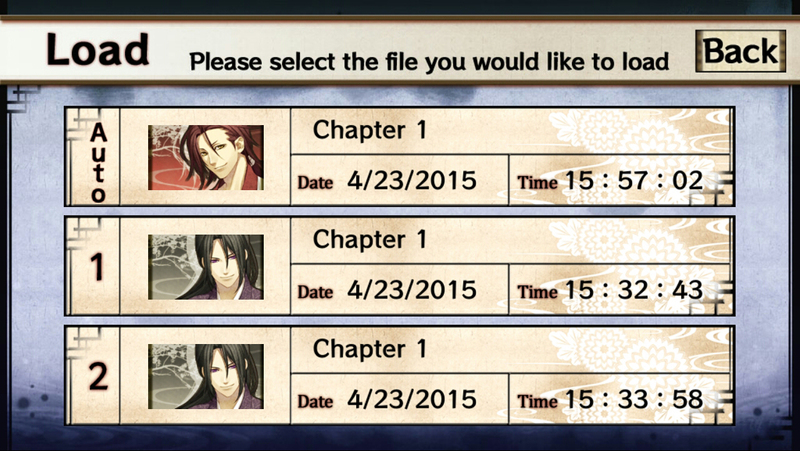 It also allows you to get to the extra tea ceremony chapter quicker! “You’re staring at me. Why?” We just can’t help it, Kazama. 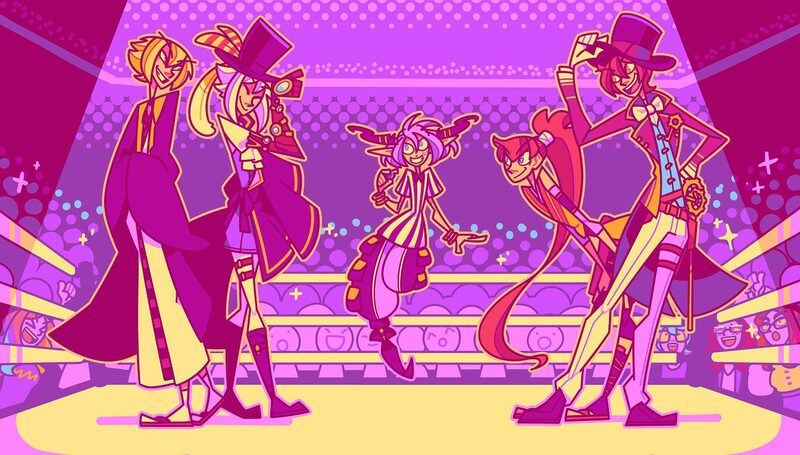 You can follow Otomate World both on Twitter and on Facebook to keep up with updates, events, and perhaps future releases that they may bring over. ← Kashuu Kiyomitsu Nendoroid Up For Order! Hello! 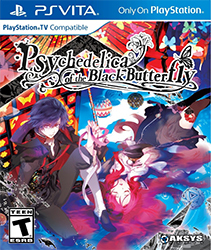 I have a question to ask, will it affect the ending if I just skip the common route and only start on the 4th and 5th series in the standard version? Hello! Sorry for the lateness in this reply! 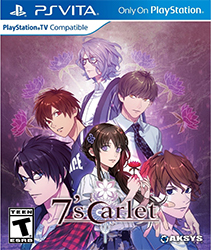 I don’t know about that standard version (since I only have the premium version), but I believe that if you start in chapters 4-5, you’ll have less choices to deal with, which may get you a bad end if the corruption level on some of the guys tips slightly. Thank you! 🙂 Haha, I’m glad you enjoyed it! If it wasn’t for the tea ceremony, I wouldn’t have bought it, so I’m glad there was at least something new to see with this release! 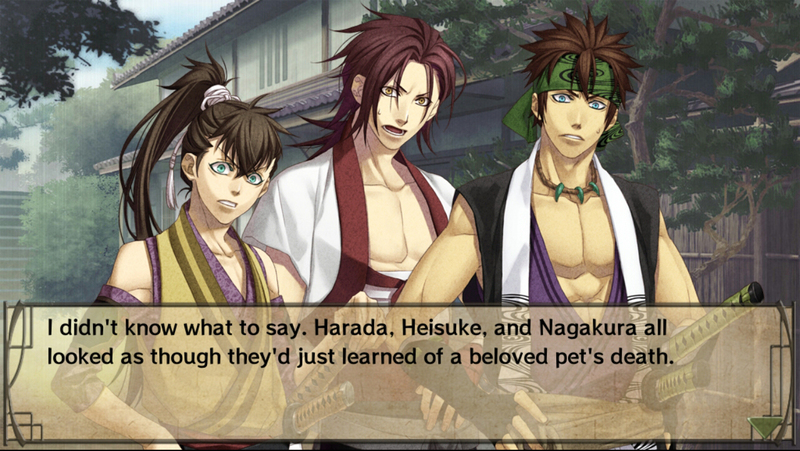 I’m just hoping that someday, maybe we’ll see Hakuouki SSL. SOMEDAY! 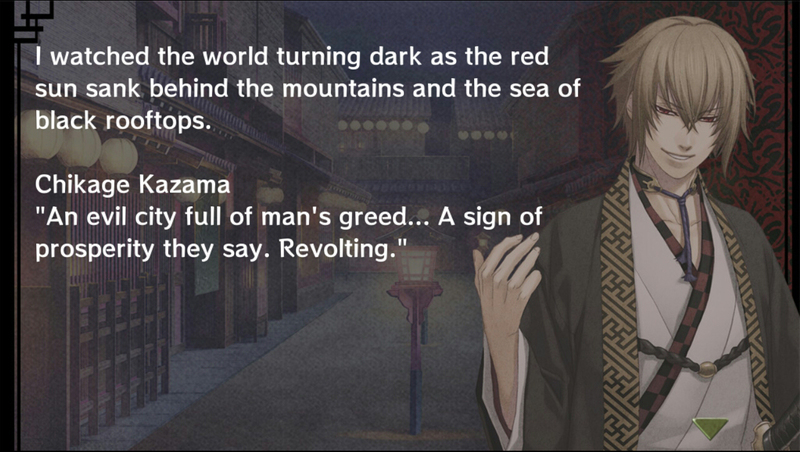 *fingers crossed* I really want there to be an official English version of the newest entry in the game, Shinkai Kazensho, where you can pursue Yamazaki, Shinpachi and Sannan! 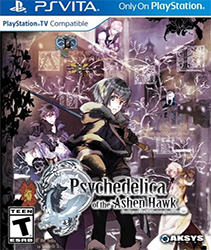 I’ll be importing it, but I’ll definitely support an official English release. We need more otoge!